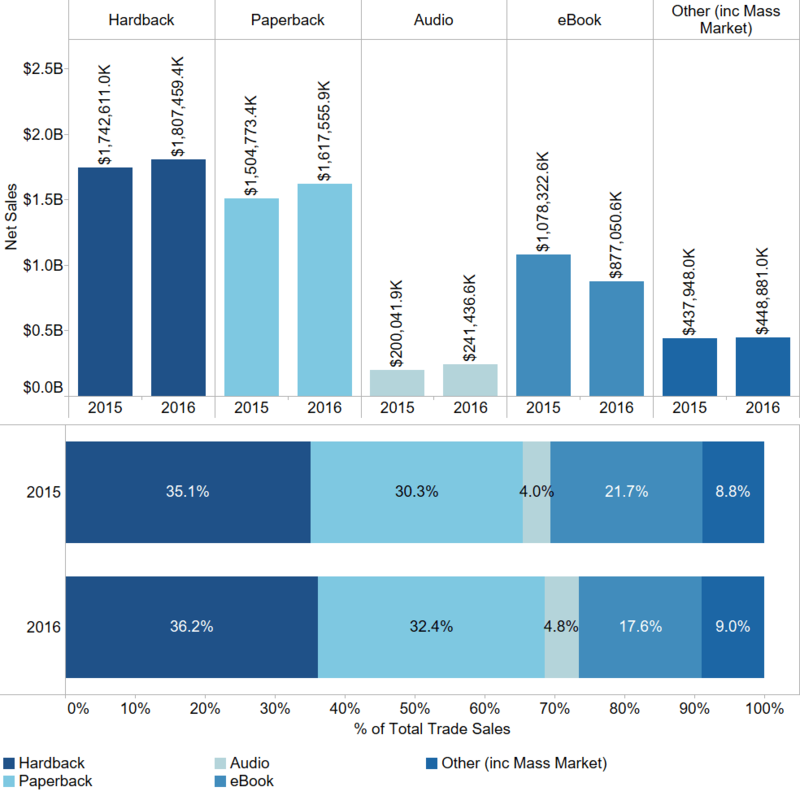 The Association of American Publishers reported on Friday that trade publishing revenues rose a fraction of a percent in the first three quarters of 2016, to $4.99 billion. At the same time, ebook revenues for the 1200 odd publishers submitting data to the AAP were down 20%, continuing the trend we've seen since the return of agency pricing in the US market. The first three quarters of 2016 saw slight growth in trade books and a decline in educational and learning materials. Publishers’ revenues for all tracked categories (Trade - fiction/non-fiction/religious, PreK-12 Instructional Materials, Higher Education Course Materials, Professional Publishing, and University Presses) declined by $684.5 million from the first three quarters in 2015. Publisher revenues include sales to bookstores, wholesalers, direct to consumer, online retailers, etc. Trade book revenue grew 0.6% to $4.99 billion through Sept. 2016 vs. the first three quarters in 2015. The $28.7 million growth came from children & young adult books and religious presses. Downloaded audio continues to gain popularity, growing 29.6%. September saw a slight increase in total sales for all tracked categories, with growth of 0.7% vs. Sept. 2015. Increases in children & young adult books and religious presses added to the year-to-date growth trend in those categories. Higher Education course materials also saw its first increase in some time, with growth of 9.2% vs. Sept. 2015. In Sept. 2016, print dominated, and there was a significant bump in downloaded audio of 38.2% vs. 2015 numbers. In the growing religious presses category, eBooks bucked the month and year’s trend with slight growth of 2.4%; they’re still down 20.0% year-to-date in the category. For the three quarters of the year, sales in all tracked categories were down 5.8% to $11.13 billion vs. the same nine months in 2015. In the first three quarters of 2016, compared to the first three quarters of 2015, trade sales were up 0.6% to $4.99 billion. Educational Materials had a revenue loss of 6.9% for K-12 Instructional Materials and 11.3% for Higher Education Course Materials, in the first three quarters of 2016 vs. 2015. Professional Publishing was down 23.6% in the first three quarters of 2016 vs. the first three quarters of 2015. These categories include business, medical, law, scientific and technical books. University presses were down 4.5% in the first half of 2016 vs. 2015. I find it interesting that religious ebooks are trending upwards, while Family Christian Stores finally threw in the towel and closed all their stores.